I’ll start where we are now. Galilee. Jerusalem is the most dramatic part of the life of Christ, but Galilee is where much of his mission took place. That’s the whole teaching. And we are living it. Yesterday began early out on a boat on the Sea of Galilee, drifting in the middle of the lake in silent meditation as the sun rose over the hill. The crew remarked afterwards that we were the most serene group of pilgrims ever. If more people were like us, they said, there would be peace in the middle East. Swamiji said when liberation comes we look back at all our incarnations and the only thing we remember is those moments when we were in the presence of God. Much of yesterday will be remembered. We went also to Capernaum and sat at the water’s edge and meditated. Then later wandered around the ruins, including the remnants of a synagogue built on the exact spot where the temple stood where Jesus taught. On pilgrimage, one is in so many places at the same time. Where we came from and where we will soon return. The physical place we have traveled to. And the ancient reality we came to experience. 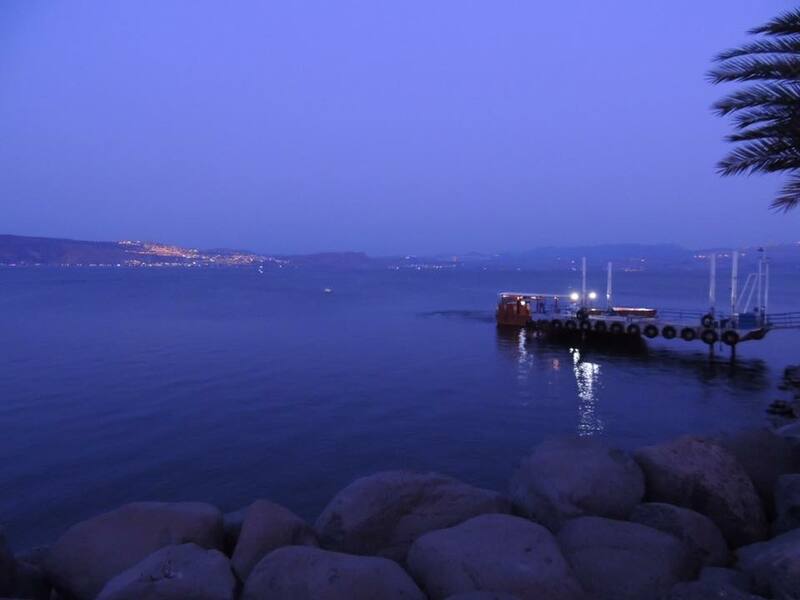 At Capernaum, we had The Festival of Light, looking out over the water, sitting on rocks under the shade of a tree. We must be careful not to let over-familiarity blind us to what we have in The Festival and in all that Swamiji has opened to us of Master’s ray. 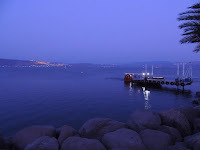 On the banks of the Sea of Galilee I felt The Festival as Swamiji intended it to be. Most Catholic priests can do their Mass in less than an hour, but Padre Pio would spend 3 times that long, because every aspect of it was to him, not mere ritual, but the living presence of Christ. 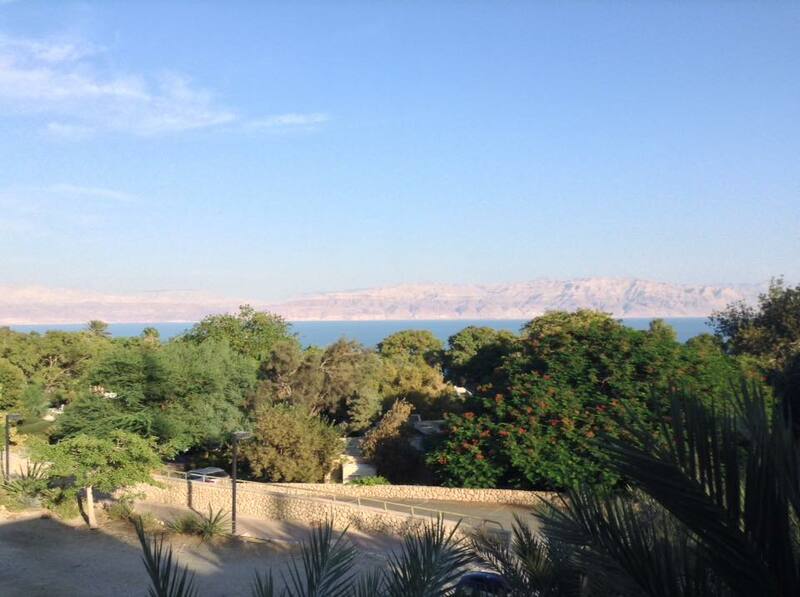 Before coming to Galilee, we were in the desert region, near the Dead Sea, at a hotel run by a kibbutz. The scope and desolation of the deserts here is hard to imagine until you see it. The beautiful hotel and grounds where we stayed has been scratched out of the desert over the past 60 years by the kibbutzim. The view from my room was a bluff of barren hills. When the first kibbutzim came to the area, the bluff on which the hotel sits was equally barren. Water was a kilometer away and no one until then had even considered that the hillside could be transformed by pipes and pumps and sheer determination. 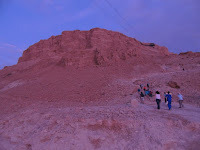 We visited Masada. Some of us walking up that massive hill in the relative coolness of pre-dawn, watching the sun rise over the Dead Sea, and the play of light on the barren, wind-carved landscape spread beneath us. Masada is a story of courage — Jews fleeing from Roman rule to take refuge on the hilltop where they lived for about 7 years until Roman legions came and crushed their rebellion. At the end, the entire community chose death before dishonor and committed suicide rather than allow themselves to be conquered. So many lifetimes of alternating tragedy and fulfillment. Literally, beyond our ability to comprehend. Understanding comes only in the presence of God. 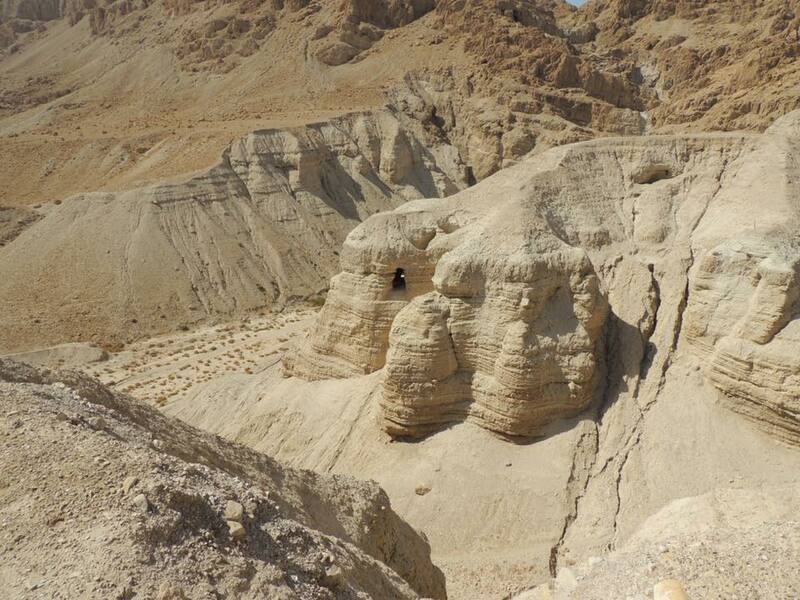 We also visited Qumran, where the Dead Sea Scrolls were found. We hiked a brief distance up into the surrounding hills, where the monks had their caves. Sitting on the ground meditating on a rocky hillside, it was easy to imagine a lifetime of silent communion. In Kali Yuga descending, spiritual seekers had to separate themselves from society. Truth was preserved in isolation, waiting for a more auspicious time. Master’s mission is Dwapara rising. Kriya has come out of the hermit’s cave, brought by Lahiri to the streets of Varanasi and through him to all of us. Different times have different needs but the communion with God is always the same. We also visited Bethlehem. It was pure joy to be there. Hot, crowded, noisy — none of it mattered to me. It was all about the baby Jesus. My arrival in Israel was later than expected. I planned to be here last Monday evening but didn’t arrive until dawn on Thursday. In all my travels till now, I’ve only missed one connection, and had luggage delayed only one time. Last week karma was different. Coming from Mumbai through Abu Dabi, we were late. I just made the flight to Rome but didn’t stop to think that my luggage probably wasn’t with me. In Rome, luggage was late coming off the plane. Of course, my bag wasn’t there. It was almost two hours before it was straightened out. Too late to get the plane to Israel. No problem; there are lots of flights. I arranged to have my bag sent to Jerusalem. Turned out it was a Jewish holiday and everyone was going to Israel. The earliest I could go was late Wednesday night. I checked into the airport hotel. It is a 2.5 hour direct flight. Searching the internet, I found a route through Munich that would take a mere 10 hours (most took 24 or more, taking you all around the planet before reaching Tel Aviv). The next day went to catch that flight. Expensive, but the first day of the pilgrimage was in Jerusalem and I wanted to be there. God had other plans. I looked at my watch and it was exactly 10:25. I left the hotel at noon, and I think my watch said 12:00. Sometime between noon and 2:00, when I went to the gate to get on the plane, the batteries in my watch lost power and slowed it down 40 minutes.. Instead of boarding the plane, I found out it had already taken off! As it happened, Kirtani and Anand and Dana Anderson were in Rome to catch a flight the next morning, so we had a few wonderful hours together. Great compensation. Overall, I was not even-minded or cheerful about the delay. Some ripple in my karma that had to be lived through. Perhaps in a previous life I died on the way to Jerusalem! I felt intensely nervous inside. The time in India touched my heart and spirit deeply. That, plus sleep deprivation, and intense eagerness to be in Jerusalem reduced me to tears on Monday when I saw I wasn’t going to make it. I went into a corner of the airport, sat on the floor and sobbed. I wasn’t sure why I was crying, but I had no choice. I was too attached, too self-concerned, too committed to my plans and my desires. God wanted me to be on pilgrimage, not on a journey of my own choosing. When I missed the plane on Tuesday, I was simply amazed. “God doesn’t want me to be in Jerusalem yet,” I said to the clerk when I checked back into the airport hotel. He didn’t even need my passport. All the information was still active in the computer. My 24-hours of internet hadn’t expired. The whole time in Rome, I had no luggage, having confidently sent it on to Israel. I expected to find it in Jerusalem, but when I got there at dawn on Thursday it hadn’t yet arrived. By then, I was having a good time and just borrowed from everyone, ready to do the whole pilgrimage in other people’s clothes. But when we returned from Bethlehem, my bag was there. I felt the karma come to zero. Whatever that was about was over. 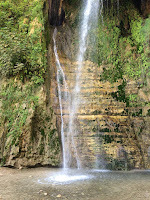 Forgot to mention baptism in the Jordan. The river is only about 20 feet across and meanders quietly through banks dense with reeds. At what is presumed to be the spot where John baptized Jesus, beautiful stone porticos have been erected but at the river itself there is a simple wooden platform that goes down in steps into the river — like the ghats in India. It is muddy looking but feels pure and blessed. As I went underwater there was a feeling of leaving all karma behind to be carried away by God. We sat on the bank and chanted a bit and sang some from the Oratorio. Where divine events have transpired, the imprint of the divine remains seemingly for eternity. While in the desert (forgive the lack of sequence to this narrative, the order doesn’t matter) we hiked into a canyon to what is called David’s spring. From the most barren, brutally hot landscape we soon found ourselves walking by a stream, passing through waterfalls until we reached a large fern grotto with water falling from the rock some hundreds of feet above. Quite apart from all the spiritual power, the land itself is stunning in its contrasts. And what the Jewish people have done with it is nothing less than a miracle. The politics of the region are overwhelming. We’ve had to tell ourselves repeatedly: Self-Realization is the answer. Therefore, the best thing we can do is what we are doing: love God, serve God, commune with God. This morning we went to Tabgha — the place where Jesus appeared to some of his disciples after his resurrection. This was when they were out on the fishing boat and the “man on the shore” asked them: “Have you caught any fish?” When they replied in the negative, he suggested they cast the net on the other side. The net filled with fishes. In that moment, John recognized it was Jesus speaking to them. He told Peter and Peter leapt from the boat and rushed to Jesus through the water. Jesus cooked fish and served bread to them. At Tabgha there is small stone church which is built over a large rock which is said to be the rock from which Jesus served the disciples. It emerges from the floor and you can sit next to it and touch it and lay your to-be-blessed items upon it. Right next to it is small opening to the Sea of Galilee. Wading out into the water, perched on the rocks time stops. I was facing the Sea when it occurred to me to face the shore. 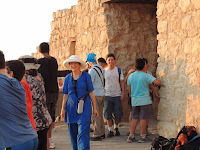 For that is where Jesus stood when he called to his disciples. Easy to see him with the eyes of spirit, and, like Peter, to drop everything and rush toward him. P.S. More photos taken by various fellow pilgrims are collected here.